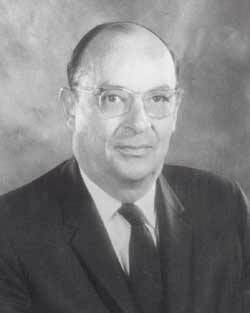 Two-time Nobel Prize winner and co-inventor of the transistor, John Bardeen. John Bardeen was born in 1908 to Charles Russell and Althea Harmer Bardeen. His father was dean of the University of Wisconsin medical school. Bardeen was an extraordinary student who advanced from third grade directly to junior high school. He started college at the University of Wisconsin, where he earned both his bachelor's and master’s degrees in electrical engineering, in 1928 and 1929. For three years, Bardeen worked as a geophysicist at Gulf Research Laboratories, in Pittsburgh. In 1936, he earned a doctorate in mathematical physics at Princeton University. Bardeen taught at Harvard University for a few years and married Jane Maxwell in 1938 while living in Cambridge. They had three children. During World War II, he worked at the Naval Ordnance Labs to help design defense systems against magnetic mines and torpedoes. After the war, he accepted a generous offer from William Shockley to work at Bell Labs. He worked especially well with Walter Brattain, another member of Shockley’s research group. In 1947, Bardeen and Brattain developed the point-contact transistor, which was based on the insight that electrons behave differently at the surface of metals. In June 1948, the invention was announced, and its first commercial use would be on telephone switching equipment four years later. Shockley quickly made improvements on the transistor design and developed the junction transistor. The three shared the 1956 Nobel Prize in Physics. In 1951, Bardeen quit Bell Labs to take an academic position at the University of Illinois. At the University of Illinois Bardeen studied superconductivity and developed a theory about how extremely cold metals function as such good conductors. From 1954 to 1957, he served on the Council for the American Physical Society, and was President from 1968 to 1969. In 1954, Bardeen was elected to the National Academy of Sciences, and then the National Academy of Engineering in 1972. In 1971 he was awarded the IEEE Medal of Honor for "his profound contributions to the understanding of the conductivity of solids, to the invention of the transistor, and to the microscopic theory of superconductivity." The following year he was awarded a second Nobel Prize for this work on the BCS (Bardeen, Cooper, and Schrieffer) theory; he would share this award with fellow colleagues Leon Cooper and Bob Schrieffer. Bardeen consulted for Xerox, General Electric, and other companies interested in applying theoretical physics to technology. He was a founding member of the Commission on Very Low Temperatures of the International Union of Pure and Applied Physics from 1963 to 1972, serving as chairman from 1969 to 1972. He remained active at the University of Illinois for the rest of his career and was still involved in the scientific community when he died in 1991, from a heart attack. Bardeen also served on the President's Science Advisory Committee from 1959 to 1962, and on the White House Science Council in the early 1980's. His honors included the Stuart Ballantine Medal in 1952, the Buckley Prize in 1954, the John Scott Medal in 1955, the Fritz London Award for low temperature physics in 1962, the Vincent Bendix Award of the American Society for Engineering Education in 1964, National Medal of Science in 1965, the Medal of Honor of the Institute of Electrical and Electronic Engineers in 1971, the James Madison Medal of Princeton University in 1973, the Presidential Medal of Freedom in 1976, and the Lomonosov Prize from the Soviet Academy of Sciences in 1987. He received 16 honorary degrees and was elected to the National Academy of Sciences, the National Academy of Engineering, and the American Philosophical Society. In 1990, Bardeen was one of 11 recipients of the Third Century Award, honoring exceptional contributions to American creativity. He was also named by Life Magazine as one of the 100 most influential people of the century.